Some of the most satisfying handy meals are the ones that can be eaten both hot and cold. 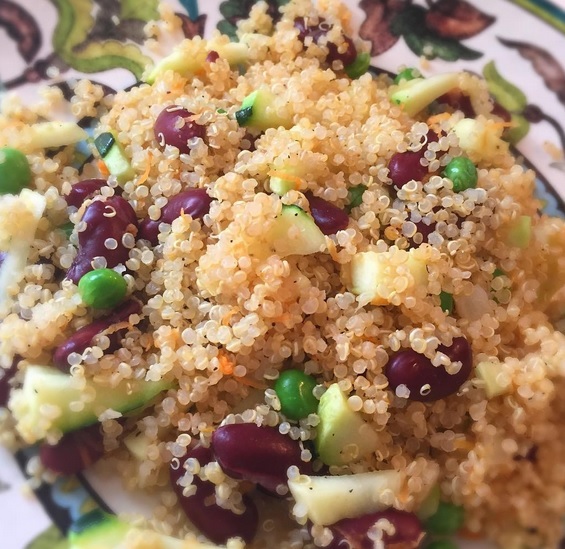 If you’re tired of the same old lunchtime sandwiches and want to avoid take-out, this easy curried quinoa pilaf is great. Have it as a side dish with dinner and simply take the leftovers with you to work or school. It also has the added health benefit of having NO added fat. Cooking without extra oil is easy. Simple, satisfying, high fiber, low fat, and full of protein, this pilaf is great hot or cold, as a main dish or a side dish. Heat your non-stick pan to medium heat. Add your onion and garlic and the 3 tablespoons water and sauté quickly. Add carrot and zucchini and beans, tossing until zucchini is soft. Add quinoa and spice and toss well, heating through. Let your imagination run wild! Add other vegetables like fresh peas, diced tomatoes, cilantro, broccoli, corn, nuts, dried fruit, and try it with other seasonings.